On Sunday, I ran the most fun, beautiful race I could have asked for! 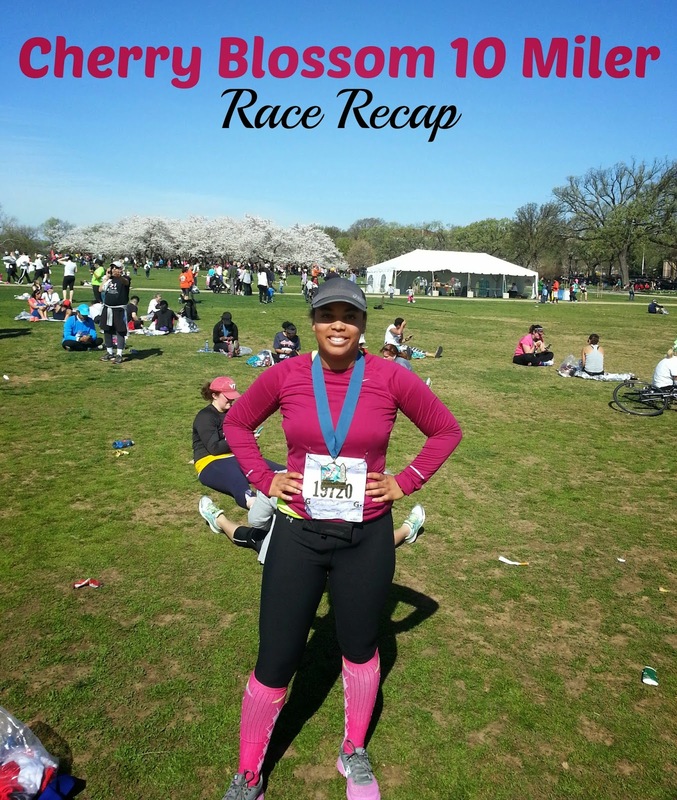 That's right, folks -- I ran the 2015 Credit Union Cherry Blossom 10 Mile Run! It has been three days since the race, and I definitely think I'm still on a runner's high, but I'm cool with that. Maybe I should run 10 miles more often...? Any-who, I am going to do my best to make sure that I don't drag this post on, despite my propensity for longwindedness (that's a word, right?). There is so much I could write about, but I think it's best to split those things up into separate posts. Don't want to overwhelm you with one MEGA post! I should be ashamed of myself, and probably shouldn't tell anybody this, but I did not eat breakfast before the race. I KNOW! Bad Lex. Bad! I had a big pasta dinner with my friends/teammates Judy and Esther the night before the race, and I really just didn't feel up to eating breakfast. I don't usually eat breakfast, either (bad, I KNOW, PEOPLE! ), so I wasn't doing anything out of the ordinary. If there's anything I've learned from reading articles and blog posts from other runners, it's that you should not do anything outside of your regular routine when it comes to race day. Granted, they also say you should eat breakfast so that you can have fuel, but who's counting? So, I did not eat breakfast... well, unless you count water, Zyrtec, and an ibuprofen as breakfast, in which case, yes, I did have breakfast. Look, everything was hurting the night before the race. My knees were aching like two angry mofos, my back hurt, and my morale was low. I did some serious stretching/foam rolling, lubed myself up with Icy Hot, wrapped myself in a heated blanket and heating pad, and went to bed. Disclaimer: I strongly advise against using this paragraph as a guide for what to do before a race. Maybe it's more of a what not to do before a race? Before I went to bed, I definitely snapped a shot of my flat runner, for posterity. After posting the photo to Instagram, I realized that one of my gloves was giving the #1 sign, which I took to mean good things were yet to come! I was grouped with the purple corral, which meant I am super slow (which I already knew). Considering that I wasn't sure if my knees were going to survive the distance, I really didn't care which group I was in. Plus, I had never actually run 10 miles, so there was that. I was off to a decent pace. Man, was the city at its finest! I absolutely love D.C. I think it's such a beautiful city, and I'm so fortunate that I live in this area. The cherry blossoms are absolutely gorgeous, and we had such great views the entire race! My friend, and also another volleyball teammate, Christie was there! And with an awesome sign! This was right around the 5K mark, and I actually think I ran my fastest 5K in a while during this race. Woohoo! It's always great to have friends and family supporting you at the race, so I was super appreciative. My parents and my brother Carson also came out to support me, but I completely missed them and didn't connect with them until the end of the race. We determined this was because I was completely entranced with the Martin Luther King Memorial, and they were right around this area, soaking in all the crazy costumes. None of us were paying attention! Ha! Anyway, shortly after seeing Christie, I took one of my ClifBar gels -- the mocha one. OMG IT IS SO GOOD! I had one at a tournament a couple of weeks ago, so I knew it agreed with my stomach and that it worked, so I was happy I picked this up at the expo. Prior to running this race, I had never really used any fuel during my runs. I mostly just took a few swigs of water, and maybe threw some Nuun in a water bottle. Now that I'm running longer distances, I'm really starting to appreciate these quick fuel sources. Go figure! So many people complain about the Hains Point section of the race, but I personally loved it. What was not to love?? Both sides of the road are lined with cherry blossoms, and while the crowd is smaller, it is much more serene than any other part of the race. It was breathtaking! I saw lots of people stop to take pictures and I almost took a running selfie myself! BUT, I really don't like to get off task when I'm running a race (especially when I'm already running it super slowly, and I'm totally uncoordinated/clumsy), and I also think that some moments are best when you experience them right then and there. I may not have a photo of this part of the race, but I have the memory! (Heck, the only photo I have of myself during the race was the one the official race photographer took!) Fortunately, because I live so close by, I can swing by and take photos of the cherry blossoms if the mood strikes, though I know other runners may never have the opportunity again. Towards the end of the Hains Point segment, there was this AWESOME all-women percussion band called Batala. They were so good! I actually paused my music and just ran to the beat of their drums. So cool! The most important thing I learned fro this wonderful experience was to believe in yourself. I know that is even cornier than what I said before, but I'm sticking with it! I kept envisioning myself failing before the race even began, and finally, when I woke up the morning of the race, I started imagining myself completing the race. I pictured myself with a medal and a smile. I pictured my stride and my pace. I imagined myself being happy during the race. And you know what? Instead of those negative images I had leading up to that morning, those positive images, and the positive affirmations I kept giving myself (YOU CAN DO IT! YOU WILL DO IT!) worked! I was also super grateful that my family and friends told me that I could do it. Having people believe in you when you didn't believe in yourself is a wonderful thing. If they believe in me, shouldn't I believe in me? See, I told you I might still be on a runner's high! Okay, so this is the abridged version of the race, which is crazy. I'm just going to wrap this up now. I am so happy that I entered the lottery, that I signed up for the race, and that I completed the race. 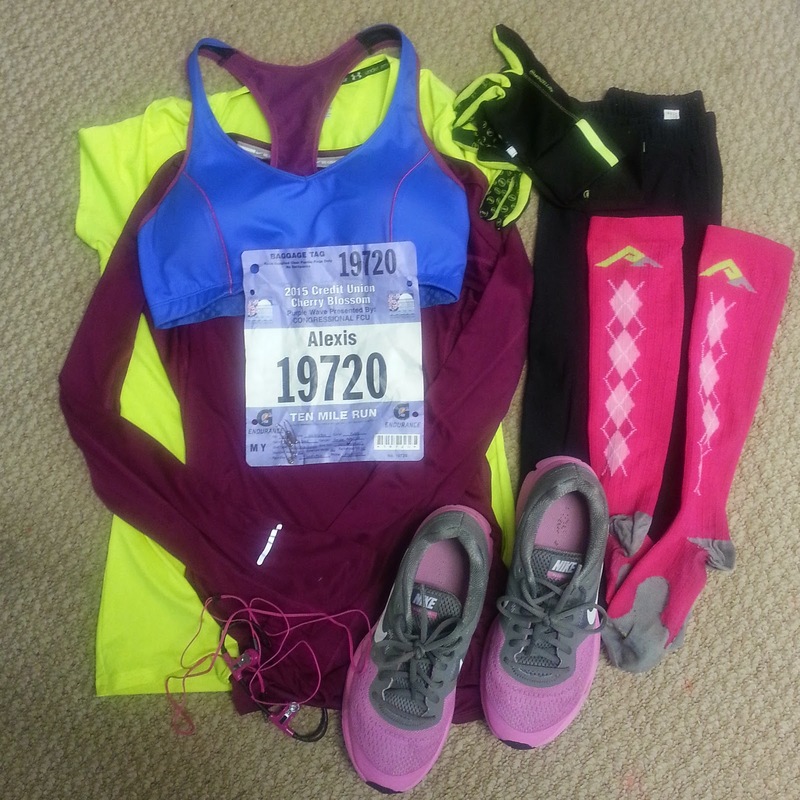 I am ready to take on the American Odyssey Relay next, and might even sign up for my first half marathon this year! The possibilities are endless! Do you give yourself positive affirmations? How do you talk yourself down from being anxious or scared about an upcoming event? What do you use as pre-race fuel? Congratulations on your first 10 mile race! It was my first Cherry Blossom Run too. 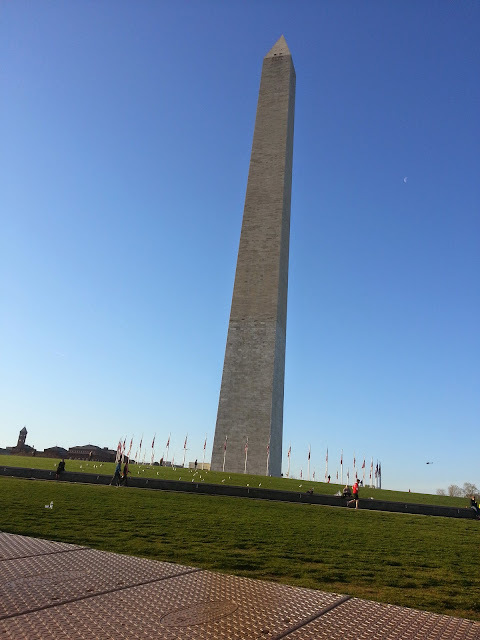 The weather was perfect and I loved Hains Point too! I totally agree that taking photos all the time does take away the special memories in a way. Having a positive attitude definitely makes a difference! Thank you! It totally makes a difference. 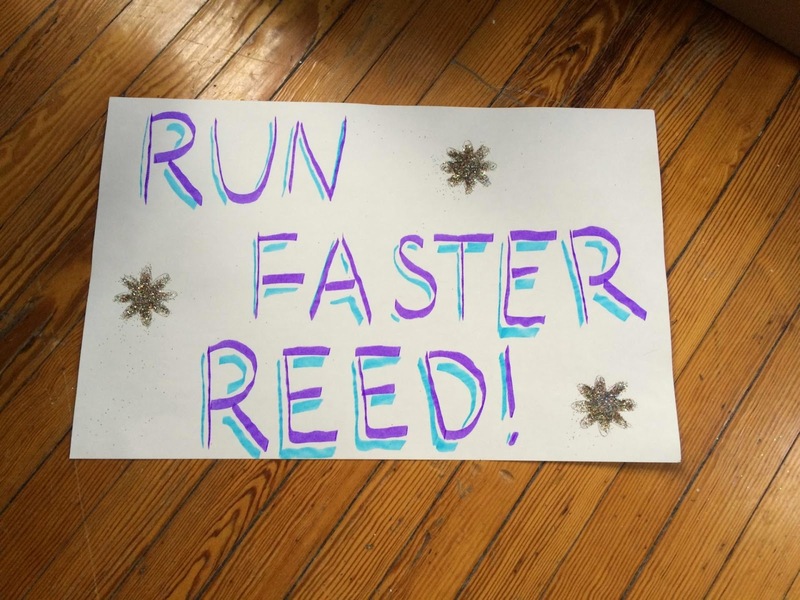 When you run a race alone - especially at a longer distance - you have to find ways to motivate yourself. Thanks so much for stopping by! way to go! it was a beautiful day to run. being mentally prepared is half the battle in races :) thanks for linking up! Thanks for hosting! (I love your blog!) I am totally going to enter the lottery next year. This has been my favorite race to date. Congrats!! It was such a beautiful day. I love when the Batala band is out on the course.